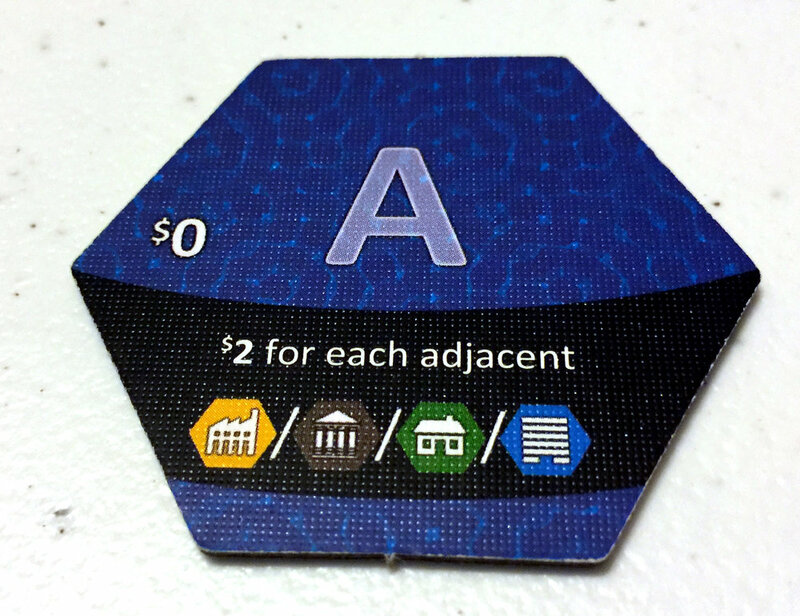 Suburbia is a city building tile placement game by Ted Alspach. Each turn, you will draft building tiles to expand your borough’s income and reputation. During each game, players compete for unique goals for big population boast. By the end, you will have turned your small town into a busy metropolis. The goal of Suburbia is to have a higher population than any of your opponents. When you draft a tile from the real estate market you will pay the cost printed on the tile plus the cost on the market above the tile. Once you pay for your new building/infrastructure, place the tile adjacent to any one of your existing tiles. Follow the steps to increase/decrease your income/reputation and any other bonus on your new tile. If any other tile is affected by this placement, make the appropriate adjustments. What if you don’t like anything on the market or you’re strapped for cash? Instead of purchasing a building, you can take any tile on the real estate market and turn it into a lake. When you do, you will pay only the market cost and place it adjacent to any one of your tiles. Any tile other then another lake tile will give your 2 coins instantly. The last tile you can draft are the starting tiles. These tiles are limited and once they are gone, they are gone. You may ask yourself, “Why would I draft another basic tile?” Well, when you draft a tile from here, you will pay the cost of the tile itself then discard any tile from the market. Remember, any time you affect the market, you have to pay the cost above the tile. But, this allows you to garnish the bonus from the starting cards, while at the same time strategically removing other tiles that would otherwise help your opponents. The other action you can take during your turn is buying an investment marker. Each person will have 3 they can use each game. Instead of buying a tile from the real estate market or basic tiles, you will choose an existing tile in your city and spend its cost again. When you do so, you will take your investment marker and place it over the cost. The investment marker will double the effect on the tile it placed on. One example is if you were to put it on the parking lot, you will get +1 revenue for the tile itself, then an additional +1 for each adjacent building or civics tile next to it. Once you have applied all of the effects of the investment marker, you will pick a tile within the real estate market and discard it. Again, paying any cost that is on the market. The game ends once the 1 more round tile is revealed and everyone takes their last turn. Add any additional population gained from the unique goals that you won and any from your hidden goals. Lastly, add 1 population for every 5 coins you have and the player with the highest final population wins! I absolutely love Suburbia. It’s a fast paced game that requires strategy in not only building your own city, but hindering your opponents. You’re constantly observing the market, your opponents boroughs, and goals to best tailor your own end game. I like that I can adjust my strategy mid game without risking major lose to population growth. Another thing I really love about this game is its replayability. Each game, every stack (A,B,C) is randomly drawn from 32 tiles (36 for stack B) and shuffled together. Then you randomly choose the visible goals to be placed on the market and 1 hidden goal for you to accomplish. With this constant change each game, I have yet to find that one set of tiles will always give you a win. Nothing feels overpowered, and it comes down to getting the right synergies that best fit your play style and goals. Solo play is also a blast. In the base game there are two different solo modes you can play. Either against yourself where you will be discarding an additional tile each turn or against ‘Dale’ the bot. When you’re playing ‘The Lone Architect’ you set it up just like a two player game, but with no goals. You also will lose 2 reputation and 2 income every time you cross a red population line. This increases the challenge of the game. So you better keep an eye on your reputation and income. When you play against ‘Dale’, he will always purchase the leftmost tile each round and will always have it’s placement to give the most reputation. After he goes all remaining tiles are removed and only 4 more come out. This limited draft is an increased challenge and not for first timers. There is only one fault I have experienced with this game, but it’s more about a players memory then the game itself. Some tiles have an ongoing effect that occurs not only in your own borough, but all boroughs. When you play one of these tiles, you have to constantly remember when a certain action or tile is played you get a benefit. There has been a few games where I completely forgot about these effects late in a game.